I don’t remember what the master of ceremony’s saying was; but it must be funny enough to make the bride smiling. It really broke the ice! 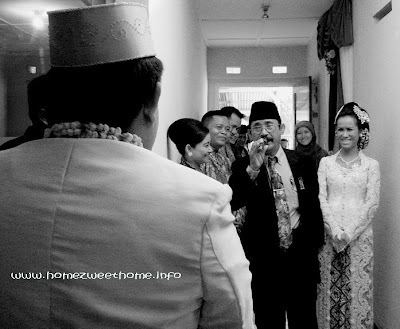 I captured this moment; just a few minutes before the sacred part of a wedding ceremony will be held. awwwwwww...how precious! I like wedding like this...so traditional. Great shot from before the wedding. I always like relaxed shots at weddings. The bride’s dress and the way she has her hair done are beautiful. I think the shot turned out lovely in black and white. That's a great shot. Everyone is so natural...and isn't that the best time to capture a moment! A perfect moment. I'm glad you were able to catch it. It will bring back so many happy memories in years to come. oh, it's so nice.. i like weddings, it's so emotional..